DrinkWire is Liquor.com’s showcase for the best articles, recipes and reviews from the web’s top writers and bloggers. 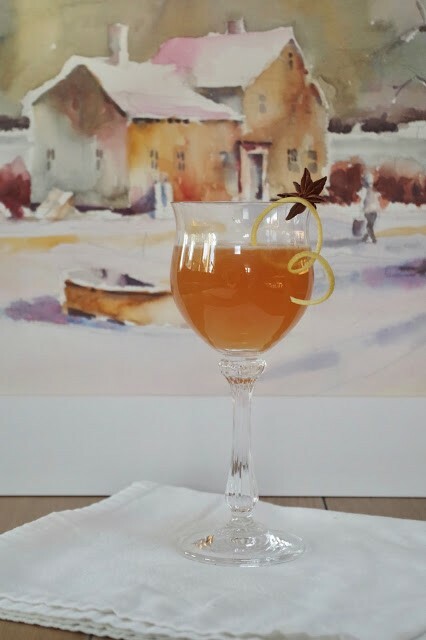 In this post, The Cocktail Artist shares a winter cocktail. We've been flipping through Ted Haigh’s Vintage Spirits and Forgotten Cocktails book and came across “The Soother”. It sounded like the perfect cold weather cocktail. This drink splits the base spirit by using half cognac and half Jamaican rum. It also includes orange curacao, lemon juice, apple juice and simple syrup. This relatively long list of ingredients allows plenty of room for experimentation. The original recipe came from the Waldorf Astoria’s Old Bar and dates back to the early 1900’s. It’s included in The Waldorf Astoria Bar Book by Frank Caiafa – where the author suggests that you could serve this as a warm drink. Now the possibilities were becoming overwhelming! We began by creating a few variations of the Soother and (along with our volunteer tasting team) did some side-by-side comparisons. The original recipe uses a tiny bit of apple juice, but (being farm market shoppers) we decided that a healthy dose of fresh apple cider would be a good modification. We tweaked the recipes for the second round and settled on two favorites – one that worked best as a cold cocktail and one served warm. For the cold version we gravitated towards a bottle of Stolen Smoked Rum that was gifted to us by friends. We had yet to use it in a cocktail, but it seemed like the smoky flavor of this Caribbean rum (with its coffee and vanilla notes) would be a good choice for our Winter Soother. We found that this rum could really take over the cocktail, so we stuck with the even ratio of rum to cognac. We used Grand Marnier as the orange liqueur, and added lemon juice and apple cider. We tried a several options for the simple syrup. You really don’t need much simple syrup in this cocktail, but it’s a good opportunity to add another layer of flavor. We liked this cocktail with cinnamon simple syrup, but for the final version we settled on using barrel-aged hickory syrup. Hickory syrup has a sweet, smoky, earthy flavor. We highly recommend Falling Bark Farm Reserve Cask Hickory Syrup (which also works really well in a bourbon Old Fashioned). 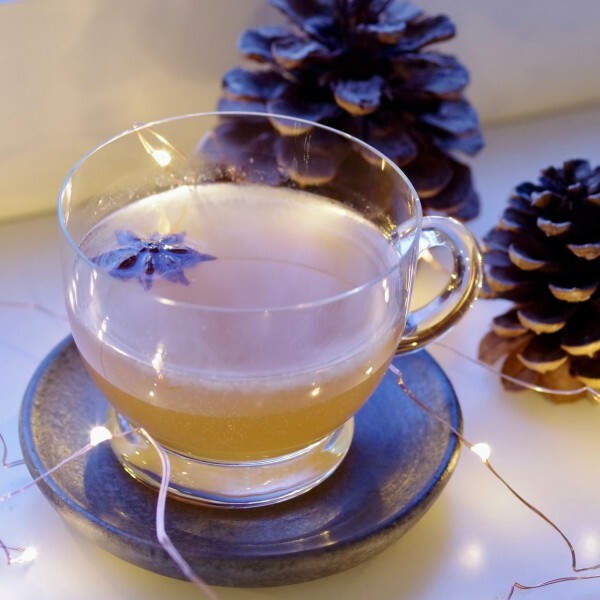 Our winning recipe for the Warm Winter Soother uses Appleton Estate Rare Blend 12 Year Rum, Cognac Prunier VSOP, Vitae Spirits Orange Liqueur, lemon juice, apple cider, and Keep it Simple Syrup Cinnamon Syrup. Vitae’s Orange Liqueur is made in Virginia from a combination of bitter and sweet orange. We really love it for mixed drinks that call for Triple Sec or Cointreau because it adds the orange notes without the excessive sweetness. We’ve paired this pair of winter cocktails with a Cocktail Artist original watercolor painting titled Snow Bound. 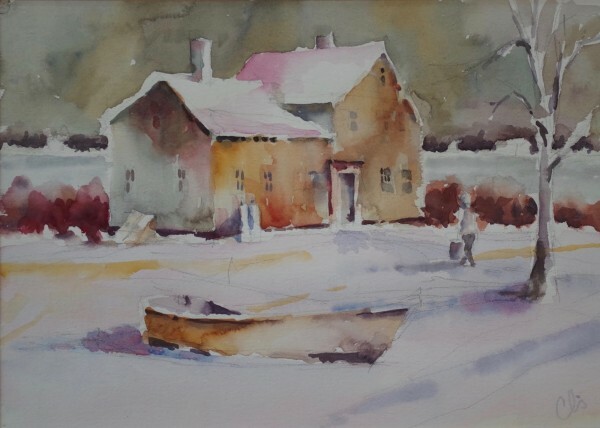 We think the figure in the painting (the guy carrying the pail) is headed in out of the cold for a nice cocktail. Maybe he invited a group of friends over to taste his recipes – it’s a great cold-weather activity! Cheers! Add all ingredients to a cocktail shaker with ice cubes. Shake for 20 seconds and strain into a cocktail coupe. Garnish with a lemon twist and a star anise. Note: We don’t recommend using maple syrup as a substitute for the hickory syrup. If you can’t get hickory syrup try cinnamon or ginger simple syrup. Start out by adding a teaspoon of syrup to the cocktail – and then taste it before adding any more. Start by filling a teacup with hot water and let it warm the cup while you mix the cocktail. Add all ingredients and 1 ½ ounces of hot water to a cocktail shaker (do not add ice) and shake well. Pour the water from the teacup and fill the cup with the cocktail. Grate a bit of fresh nutmeg on top and garnish with a star anise. We mix art with mixology. The cocktail recipes on our blog are are versions of old standbys as well as things we came up with through trial and error. The artwork is all original and is inspired by (or inspires) the cocktails.